This recipe (if you can call it that!) 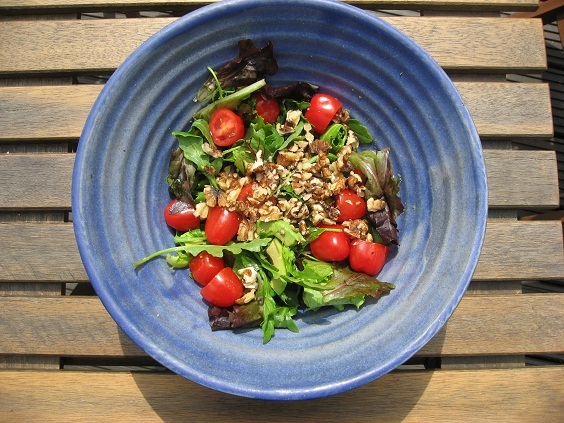 really couldn’t be simpler, and if you’re lucky enough to still be having some hot weather, it makes the perfect lunch. 1. 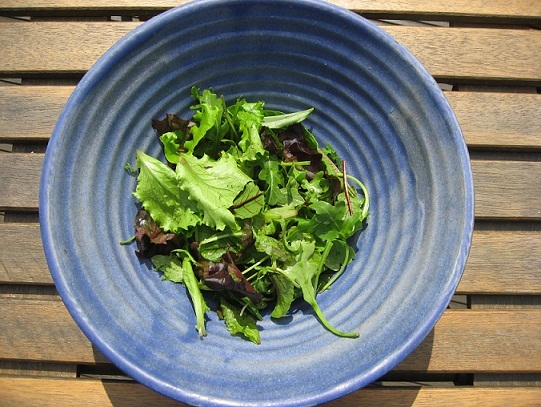 Put a bag of green salad mix into a nice bowl. 2. Add some halved cherry tomatoes, sliced avocado, and some chopped walnuts. Sprinkle with olive oil and balsamic vinegar. 3. 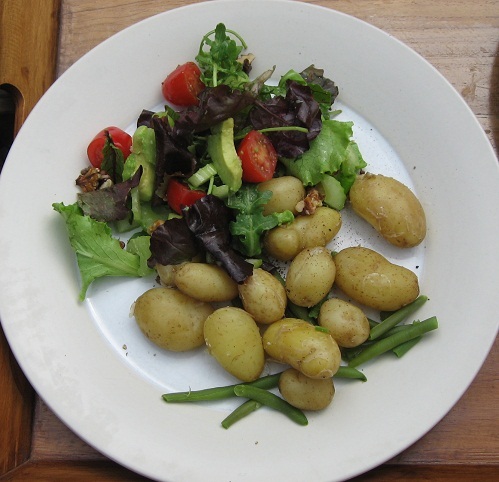 Dish up with some just boiled salad potatoes and green beans. Add a dash of freshly ground black pepper, and voila! What’s a potato farl, I hear you ask. 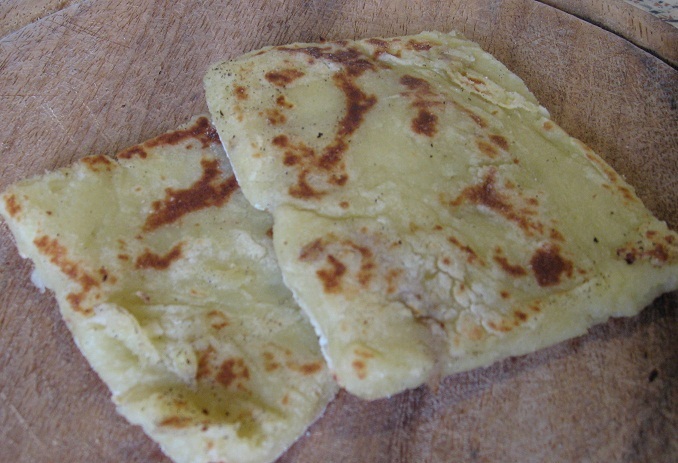 Well, it’s a northern Irish potato bread, made flat and cooked on a griddle pan. It is an integral part of an Ulster Fry, a variation on the full cooked breakfast beloved of the people of the islands of Britain and Ireland, and containing all sorts of fried ingredients including egg, sausage, bacon, black pudding and white pudding, as well as the slightly healthier beans, tomatoes and mushrooms. Alongside the potato farl, you may also find fried soda bread! Well, you can build a healthier, veggie version of this meal with grilled tomatoes sprinkled with dried basil, mushrooms cooked in a small amount of olive oil and the usual or reduced sugar baked beans. 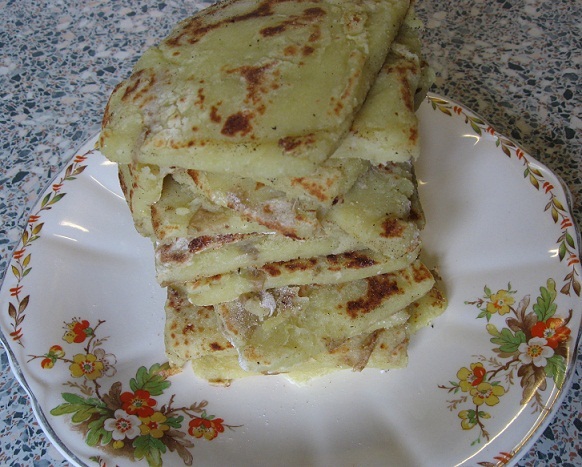 And this recipe for a gluten free potato farl makes a delicious base. I’ve added grated apple to the mix as this keeps the farl from being too dry at the end. They freeze well, so make a stack and keep some for later! Scrub or peel the potatoes, but leave the skins on if they’re good enough. Boil them until tender (20 – 30 minutes). Drain and add the butter, then mash the potatoes thoroughly. Add the grated apple, then sift in the flour a little at a time, until it forms a soft dough. On a floured surface, roll out the dough until it is approx 1cm or 1/2 inch thick. Cut the dough into rough squares. Use a griddle or heavy bottomed frying pan and place it over a high heat. Adjust the heat down a little once the pan is hot. Don’t add any butter or oil, but place the farls, one or two at a time on the griddle, cooking until they start to brown. Flip them over and repeat on the other side. Serve with a cooked breakfast or as pancakes drizzled with maple syrup. Following my post on summer reading, a comment alerted me to the writing of food critic Ruth Reichl and I decided to seek her out for my recent trip. I was delighted I did because she really is a great writer, passionate and a brilliant story teller, with a wonderful way of describing food. I read ‘Comfort Me With Apples’ a memoir from the time when she first became a restaurant critic up to the birth of her son. Her adventures are extraordinary, as is the food she tastes along the way, and she makes the flavours and the experiences come alive. The book also features recipes, and this is one I’ve copied down to try as soon as I have a day spare when I can eat as much garlic as I like without inflicting it on a wider public! Wash the spinach well and drain it in a colander. Put half of the spinach, with water clinging to its leaves, in a heavy p6 to 8 quart pot and cook over a moderate heat, covered, stirring occasionally, until slightly wilted, about 1 minute. Add the remaining spinach and continue to cook over moderate heat, covered, stirring occasionally, until wilted but still bright green, about 1 minute more. Drain the spinach in a colander. When the spincach is cool enough to handle, squeeze it dry in small handfuls and chop finely. Melt the butter in a large, deep, heavy skillet over moderate heat until foam subsides. Cook the onion in the butter, with salt and pepper to taste, stirring, until softened, about 8 minutes. Stir in the garlic and cayenne and cook, stirring, for 2 minutes. Add the cheese and cook over moderately low heat, stirring, until the cheese is melted and all the ingredients are combined will. Season the mixture with salt and pepper and spread in a well-buttered heavy 1 1/2 to 2 quart shallow baking dish. Sprinkle the top evenly with bread crumbs and bake in the middle of the oven until golden brown on top and bubbling, 20 to 25 minutes. Inspired by my recent trip to Ireland, where I seemed to eat delicious brown soda bread at every turn, I had a thought that this wonderful bread might be the ideal basis for a gluten free bread recipe. 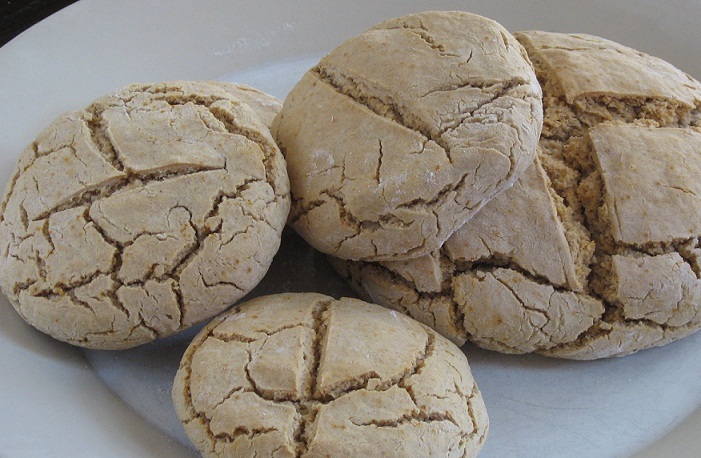 Soda bread is always flattened to make something of a disc shape, rather than a ‘loaf’ shape, so it’s less of a concern that the bread won’t rise very much. The texture is also dense and moist. I’ve tried this recipe several times now, including making a large loaf, which I hoped would make bigger slices for sandwiches and slices that would fit nicely in the toaster. But the larger loaf just wouldn’t cook in the middle, so it really is best to make the small loaf or the rolls as below. This is a basic and simple recipe, which I’m sure is ripe for adaptation! The flour I used was a mix of Doves Farm white gluten free flour, brown rice flour and buckwheat flour. Following on from Wednesday’s post about Ireland, I’ve got a couple more eating places to recommend. 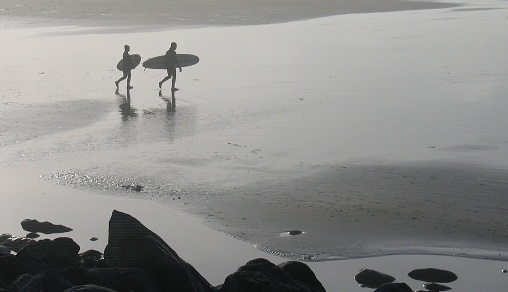 The first is in Lahinch the area’s surfing paradise. Well, I don’t surf and the huge crashing waves look pretty scary to me, but there are always plenty of surfers in the water, so I guess it’s good!